A recent federal regulation concerning gas pipeline safety requires all natural gas utilities to notify its customers of their right to request installation of an Excess Flow Valve (EFV). 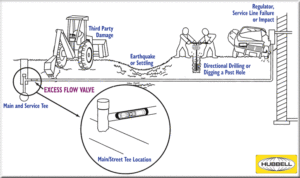 An EFV is a safety device installed inside a service line as near as practical to the gas main. EFVs are designed to shut off, or significantly reduce the flow of natural gas if a service line downstream of the EFV is broken or severed. An EFV does not protect against leaks on customer house piping or appliances. Many OPU customers already have an EFV insalled on their existing natural gas service line. Customers who do not have an EFV may be elibigle to have one installed at their own expense. Costs typically range from $750 to $2,000 depending on the location and conditions of the installation site. Customers can request more information about EFV installations by calling our customer service department at 507-451-2480. An additive, called odorant, is added to natural gas to give it a distinct smell similar to rotten eggs. If you smell this, and can’t find the source immediately, go to a neighbor’s house and call OPU at 451-1616. DO NOT turn electrical switches on or off or use a flashlight or telephone in the home, because an electrical spark could ignite the gas and cause an explosion. According to the U.S. Consumer Product Safety Commission, there are 2,000 fires annually involving gas appliances and flammable vapors…more.. When lighting any match-lit burners or ovens, always light the match before turning on the gas. If the flame goes out, turn off the burner and let the gas disperse before relighting. Clean away any grease, oil or debris from the area around burners to help prevent fires. Keep baking soda nearby-a cheap and effective way to put out grease fires. Move any flammable objects-towels, curtains, calendars-away from range burners and other hot surface. Never use your oven to heat your home. This misuse of your oven puts you at risk of burns from hot surfaces and shortens the life of oven parts and controls. Move all materials that can burn easily (mops, brooms, laundry, newspapers, gasoline, etc.) away from your water heater. Your furnace should be serviced once a year to help maximize its life and performance. Follow the instructions in the owner’s manual, or call a heating or plumbing contractor. Have your furnace checked for fire hazards such as a damaged firebox and any dislodged, clogged or rusted vents. Clean or replace your filter after each month of heavy usage. Replace the blower door cover after checking your filter. Securely fasten the door that covers the pilot light and burner area. SECURELY CLOSED DOORS ARE CRITICAL TO SAFE OPERATION. Be sure that no burnable materials-paints, solvents, fuels-are stored near your furnace. Air-supply vents must be clear of obstructions. Furnaces need a constant supply of fresh air to run efficiently and safely. Kerosene heaters or other unvented heaters are not recommended.